Forms have many properties that you can use to affect their look and behavior. The properties are broken down into categories: Format, Data, Event, and Other. To view a form’s properties, you must first select the form. 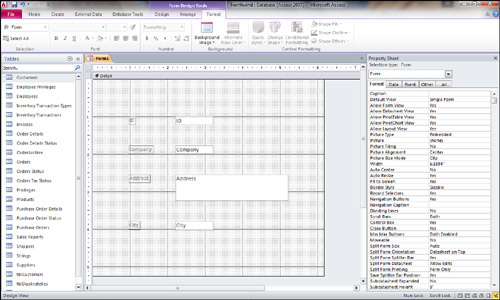 To do that, click the form selector (the small gray button at the intersection of the horizontal and vertical rulers). It is important that you understand how to work with form properties. The sections that follow begin by focusing on the Properties window. They then hone in on a discussion of some of the important form properties. After you have selected a form, you can click the Properties button on the toolbar to view its properties. The Properties window, shown in Figure 1, consists of five tabs: Format, Data, Event, Other, and All. Many developers prefer to view all properties at once on the All tab, but a form can have a total of 119 properties! Instead of viewing all 119 properties at once, you should try viewing the properties by category. The Format category includes all the physical attributes of the form—the ones that affect the form’s appearance, such as background color. The Data category includes all the properties of the data that the form is bound to, such as the form’s underlying record source. The Event category contains all the Windows events to which a form can respond. For example, you can write code that executes in response to the form being loaded, becoming active, displaying a different record, and so on. The Other category holds a few properties that don’t fit into the other three categories. Figure 1. Viewing the Format properties of a form. As mentioned in the preceding section, a form has 119 properties. Of those 119 properties, 52 are Event properties, and they are covered in most books focused on Access programming. The following sections cover the Format, Data, and Other properties of forms. The Format properties of a form affect its physical appearance. A form has 39 Format properties. The most important ones are described in the following sections. The Caption property sets the text that appears on the form’s title bar. The selected option becomes the default view for the form. The Scroll Bars property determines whether scrollbars appear if the controls on a form don’t fit within the form’s display area. You can select from both vertical and horizontal scrollbars, neither vertical nor horizontal scrollbars, just vertical scrollbars, or just horizontal scrollbars. A record selector is the gray bar to the left of a record in Form view, or the gray box to the left of each record in Datasheet view. It’s used to select a record to be copied or deleted. The Record Selectors property determines whether the record selectors appear. If you give the user a custom menu, you can opt to remove the record selector to make sure the user copies or deletes records using only the features specifically built into the application. Navigation buttons are the controls that appear at the bottom of a form; they allow the user to move from record to record within a form. The Navigation Buttons property determines whether the navigation buttons are visible. You should set it to No for any dialog box forms, and you might want to set it to No for data-entry forms, too, and add your own toolbar or command buttons to enhance or limit the functionality of the standard buttons. For example, in a client/server environment, you might not want to give users the ability to move to the first or last record because that type of record movement can be inefficient in a client/server architecture. The Dividing Lines property indicates whether you want a line to appear between records when the default view of the form is set to Continuous Forms. It also determines whether Access places dividing lines between the form’s sections (that is, header, detail, and footer). The Auto Resize property determines whether Access automatically sizes a form to display a complete record. The Auto Center property specifies whether a form should automatically be centered within the Application window whenever it’s opened. The Border Style property is far more powerful than its name implies. The options for the Border Style property are None, Thin, Sizable, and Dialog. The Border Style property is often set to None for splash screens, in which case the form has no border. When the Border Style property is set to Thin, the border is not resizable and the Size command isn’t available in the Control menu. This setting is a good choice for pop-up forms, which remain on top even when other forms are given the focus. The Sizable setting is standard for most forms; it includes all the standard options in the Control menu. The Dialog setting creates a border that looks like the border created by the Thin setting. A form with the Border Style property set to Dialog can’t be maximized, minimized, or resized; when the border style of a form is set to Dialog, the Maximize, Minimize, and Resize options aren’t available in the form’s Control menu. The Dialog setting is often used along with the Pop Up and Modal properties to create custom dialog boxes. The Close Button property determines whether the user can close the form by using the Control menu or double-clicking the Control icon. If you set the value of this property to No, you must give the user another way to close the form; otherwise, the user might have to reboot his or her computer to close the application. The SubdatasheetHeight property is used to designate the maximum height for a sub-datasheet. The SubdatasheetExpanded property allows you to designate whether a sub-datasheet is initially displayed in an expanded format. When this property is set to False, the sub-datasheet appears collapsed. When it is set to True, the sub-datasheet appears in expanded format. The Moveable property determines whether the user can move the form window around the screen by clicking and dragging the form by its title bar. You use the Data properties of a form to control the source for the form’s data, what sort of actions the user can take on the data in the form, and how the data in the form is locked in a multiuser environment. A form has 14 Data properties (several of which we cover here). The Record Source property indicates the table, stored query, or SQL statement on which the form’s records are based. After you have selected a record source for a form, the controls on the form can be bound to the fields in the record source. The Field List window is unavailable until you have set the Record Source property of the form. You use the Filter property to automatically load a stored filter along with the form. I prefer to base a form on a query that limits the data displayed on the form. You can pass the query parameters at runtime to customize exactly what data Access displays. The Order By property specifies in what order the records on a form appear. You can modify this property at runtime. The Allow Filters property controls whether you can filter records at runtime. When this option is set to No, all filtering options become disabled to the user. The Data Entry property determines whether users can only add records within a form. You should set this property to Yes if you don’t want users to view or modify existing records but want them to be able to add new records. Format properties affect the appearance of a form. Data properties affect the data underlying a form. This section focuses on the Other properties of a form. As you’ll see, although these properties don’t fit neatly into the Format and Data categories, they are extremely robust and powerful properties. The most commonly used properties are covered here. Pop Up— The Pop Up property indicates whether a form always remains on top of other windows. You will often set this property, along with the Modal property (discussed next), to Yes when creating custom dialog boxes. Modal— The Modal property indicates whether the user can remove focus from a form while it’s open. When the Modal property is set to Yes, the user must close the form before he or she can continue working with the application. As mentioned earlier, this property is used with the Pop Up property to create custom dialog boxes. Cycle— The Cycle property controls the behavior of the Tab key in a form. The settings are All Records, Current Record, and Current Page. When you set the Cycle property to All Records, the user moves to the next record on a form when he or she presses Tab from the last control on the previous record. When the property is set to Current Record, the user is moved from the last control on a form to the first control on the same record. The Current Page option refers only to multipage forms; when you set the Cycle property to Current Page, the user tabs from the last control on the page to the first control on the same page. All three options are affected by the tab order of the objects on the form. Tag— The Tag property is used to store miscellaneous information about a form. This property is often set and monitored at runtime to store necessary information about a form. You could use the Tag property to add a tag to each of several forms that should be unloaded as a group.